ALGIERS (Sputnik) - Algeria's army chief Ahmed Gaid Salah tried to appease protesters on Tuesday by promising them new opportunities if they refrain from violence. ALGIERS (Sputnik) - The Algerian moderate Islamist Movement of Society for Peace party is not engaged in talks with the interim government as it calls for the resignation of Cabinet led by interim President Abdelkader Bensalah, Nasser Hamdadush, the head of the parliamentary group, told Sputnik. Algeria's interim president Abdelkader Bensalah said Tuesday that the country's army is aligned with the constitution as a way to get out of the political crisis, adding that "we will soon have a president who will build a new Algeria", Reuters reported. On Tuesday, the Algerian parliament held an extraordinary session with lawmakers from both the lower and upper houses attending the event to confirm that the post of the country's president was vacant and it didn't breach Article 102 of the constitution. Algeria's parliament is set to meet on Tuesday to name an interim successor to President Abdelaziz Bouteflika, after weeks of protests pushed the 82-year-old leader from power. Sputnik spoke to Algerian journalist Khaled Drareni about what the future holds. 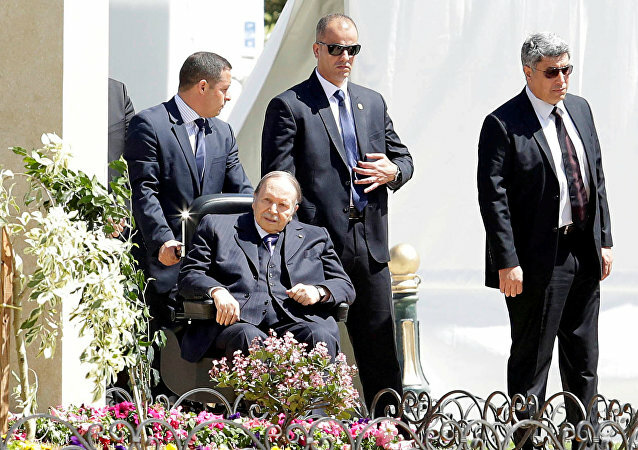 CAIRO (Sputnik) - Algerian former president Abdelaziz Bouteflika who has recently resigned after nearly 20 years in power, addressed the nation on 3 April, asking for pardon, but at the same time saying that he was proud of having led the nation in all these years. After the Council's approval, it is expected that Abdelkader Bensalah, the head of the country's upper chamber, will govern the country until the next presidential election. 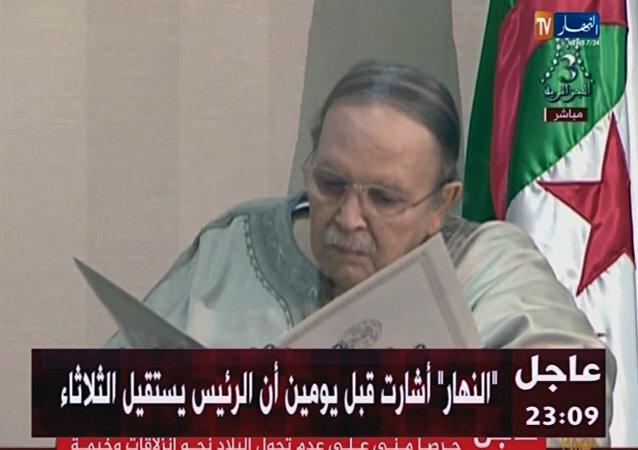 CAIRO (Sputnik) - Algerian President Abdelaziz Bouteflika said in a message to the head of the country's Constitutional Council on Tuesday that he had taken all measures to ensure continuity of power after his resignation. Algerian President Abdelaziz Bouteflika has submitted his resignation, the country's state news agency APS reported on Tuesday. CAIRO (Sputnik) - Thousands of protesters gathered on Friday for the sixth consecutive mass anti-government protest throughout various Algerian cities demanding that the government implements Article 7 of the national constitution, El-Watan reported. CAIRO (Sputnik) - The party of the Algerian ruling coalition, the Democratic National Rally (RND), on Wednesday called on Algerian President Abdelaziz Bouteflika to step down, the party said in a statement. MOSCOW (Sputnik) - Algerian President Abdelaziz Bouteflika should be declared unable to govern under Article 102 of the country's constitution, Army Chief of Staff Ahmed Gaid Salah said Tuesday in a televised address. Sputnik has spoken to Ali Benflis, a former head of the Algerian government. He believes that the civil movement in Algeria will be led exclusively by the Algerian people, who have fiercely refused any outside interference in the current crisis. Sputnik spoke with Algerian France-born billionaire and opposition politician Rachid Nekkaz, who claims that he has been placed under house arrest 250 km from Algeria's capital. CAIRO (Sputnik) - Two parties of the Algerian ruling coalition — the National Liberation Front (FLN) and the Democratic National Rally (RND) — voiced support on Wednesday for protesters who are calling for the transition of power in the North African country. In light of large scale demonstrations, public transport in Algeria’s capital isn’t working, and private bus companies are afraid to carry people from the suburbs. The protesters have told Sputnik how they manage to organise themselves in order to get to the rallies.